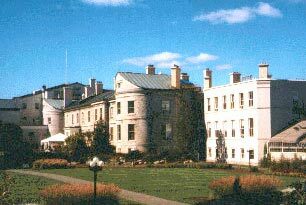 Rideau Hall in Ottawa was built in 1838 for a local industrialist, Thomas MacKay. 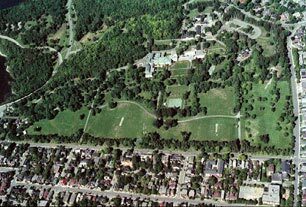 In 1864, it was leased as a temporary residence for the Governor General, and then purchased as such in 1868. 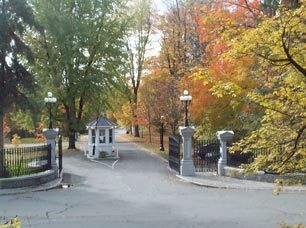 The official residence known as Rideau Hall comprises 88 acres of grounds, the main building with about 175 rooms covering approximately 9,500 square meters plus 24 outbuildings. About 500 square meters in the main building are used for the private areas; the remaining 9,000 square meters are state, service and administrative areas. 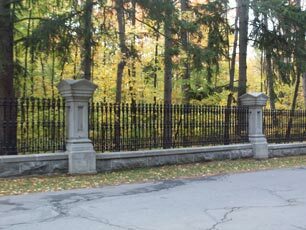 This wall dates back to the first building that was built on the Rideau Hall site. The masonry was quite deteriorated. 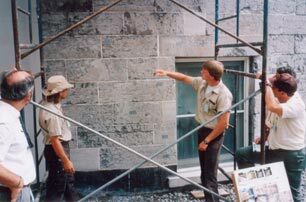 With the collaboration of the heritage restoration program of Ottawa's Algonquin College, our team restored the weathered stones and replaced the stones that were rotted. The wall recovered its structural and weather proofing integrity. 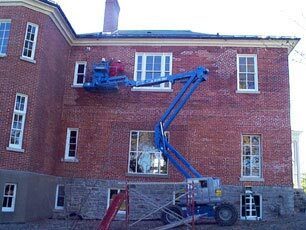 Following a careful inspection and testing, almost all the chimneys at Rideau Hall were found to be in an advanced state of deterioration and deemed unsafe. Six chimneys were restored during 1995. One of the challenges of this project was to find bricks that matched the existing ones in size and color. With a length of 2,500 meters (7,700 feet) and more than 100,000 parts, the restoration of this fence was quite a challenge. 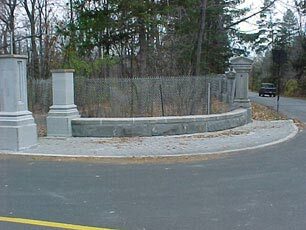 A complete survey of the fence and all its elements had been done by the firm of Barry Padolsky Arch. First, our team had to determine what were the exact causes of the fence's deterioration. This was done with the help of conservators. It was found that the metal elements were made up of five different types of metal. Most of the elements were made of cast iron that had been galvanized and were in good condition. 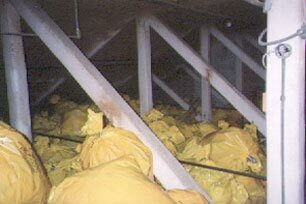 The metal elements of the most damaged sections were found to be not galvanized. Each new cast iron piece bears the year of casting; 2001 in this case Pillar re-installation after restoration work in the workshop. Most of the 346 masonry pillars were made of cast stone. AAR, a substance which when in contact with humidity expands the aggregate crystals volume by up to 30% in one direction, was found to be present in the concrete of the lower-wall structure. You can imagine the problems that this can create. Once our research was finished, our team presented a restoration program that spanned over eight years. The Perimeter Fence is to be restored section by section beginning with the most damaged ones. The restoration project will resolve the drainage and vegetation problems, and repair of the concrete foundations, the masonry lower-wall, the cast-stone and stone pillars and the metals parts. During the second year of our research on this project, three cars crashed into the fence during the fall and winter. This gave us the opportunity to try out and fine tune our restoration techniques while the car insurance companies paid for the work. [click] For additional images of siteworks. An ornamental lantern provides natural light to the main staircase in Rideau Hall. It was built in 1865. Close inspection revealed that it did not meet the current Building Code in case of fire. Plans and specifications were prepared to upgrade the glazing, provide structural support to the original decorative frame, install new mechanical and electrical systems and provide adequate fire protection. This was a complex project that required custom fabrication of many coponents. The Visitor Reception Center was rehabilitated to welcome a maximum of 40 people. 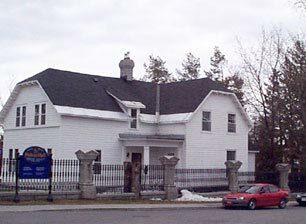 11 Rideau Gate, rehabilitated into a Visitor Reception Center; a new public washrooms addition (to the left of the image) was built to integrate with the existing architecture. 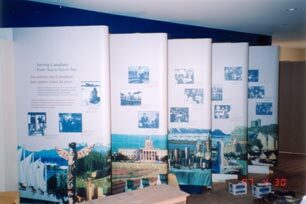 His Excellency Roméo LeBlanc, Governor General of Canada and Mr. Marcel Beaudry, President of the NCC officially opened the new visitor reception center on May 15, 1997. This project is a modest intervention but one which was done with a great deal of attention to details. 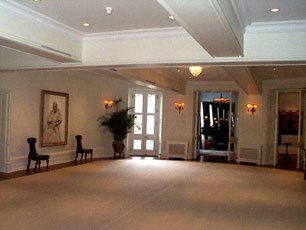 It is a warm and welcoming space that functions efficiently for a group of 40 visitors. The interpretation area and the retail space are housed in only one hundred square meters on the ground floor. The rooms on the first floor were renovated to accommodate staff and administrative functions. The project which involved the participation of consultants, staff from the NCC and the Office of the Secretary of the Governor General, was completed within a very tight schedule of seven and a half months and with great teamwork. Building rehabilitation costs were $115,000 and exhibit fabrication costs were $144,000. Copper roof restoration in progress, replacing only the damaged sections. Restoration work almost complete; the new copper will eventually oxydize to harmonize with the older sections. 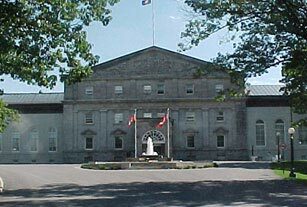 Several roof leaks occurred during the late 1990s in Rideau Hall's main building. 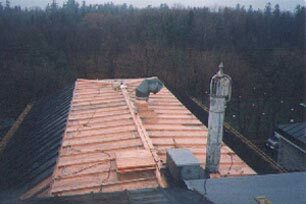 Water infiltration was caused by various roof defects such as copper roofs damaged by ice removal operations, non-water tight joints or flashing, temporary maintenance repair, faulty or insufficient roof slopes. Ice damming was also found to be a serious public safety issue. Technical investigations revealed that the copper sheathing still had 25 to 30 years of useful life. The approach to restore the areas which could be restored and to replace the areas in the worst shape was found to be the most economical approach respecting the heritage character of the property. New security anchors were installed for the maintenance personnel. An initial $250,000 roof repair and replacement program was initiated and will be carried over several years. The Ottawa region is fortunate to possess several very good copper roofing contractors and one of the very best firms won the public tender bid for this work requiring specialized skills and knowledge. 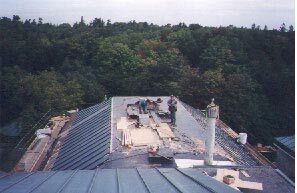 Faulty slopes were corrected, new water tight details were designed and a new protective membrane was installed in the areas where the roof was replaced. 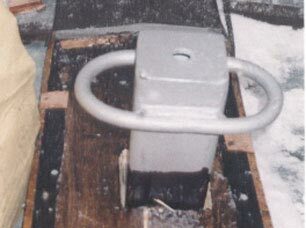 New ice guards with heating cables were installed in the areas where ice damming was most severe. Asbestos removed and bagged, ready for disposal Temporary protection to prevent asbestos dust to contaminate other building sections. 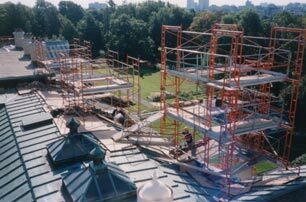 The original roof structure at Rideau Hall was covered with fireproofing material containing asbestos. It was necessary to remove and replace this material to repair the structure damaged by fire in 1904 and to do the work necessary to install roof anchors that are to be used by workmen doing repair or maintenance work on the roofs. 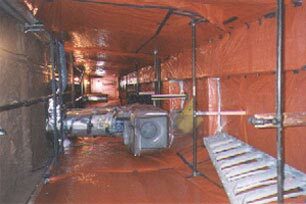 The removal of material containing asbestos is a delicate and costly operation that is regulated by the Ontario ministries of Labor and Environment. This project was to introduce air conditioning and upgrading mechanical and electrical systems to a lovely historical room. The challenge was to introduce these systems in a classified heritage environment without diminishing the heritage character defining elements of the room that dates back to 1838. The project had to be completed within a very tight schedule but quality was not compromised and the results are very pleasing. 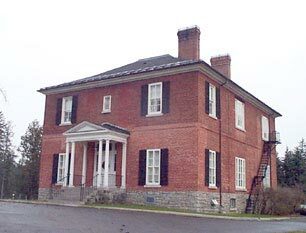 Ever since its construction, Rideau Cottage was the residence of the Secretary to the Governor General. 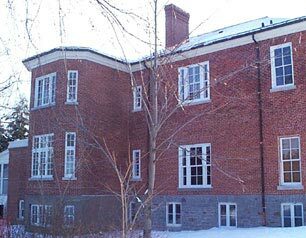 This residence is located on the site of Rideau Hall, close to the Main Building. Not long after his Excellency Roméo LeBlanc left office and the new Governor General, Adrienne Clarkson took office, there was a change of Secretary to the G.G. 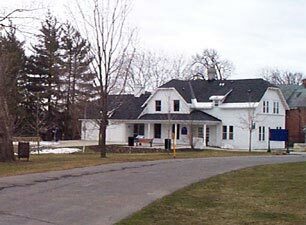 This was an opportunity to access Rideau Cottage and undertake much needed restoration and rehabilitation works. The basement floor was a wooden floor laid on tree trunks. Humidity was always rising from the basement creating all sorts of problems. 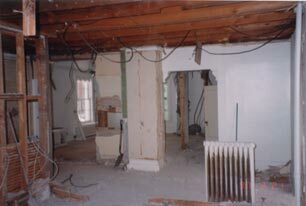 The old floor was removed, the area researched by an archaeologist, then a cement floor was built. 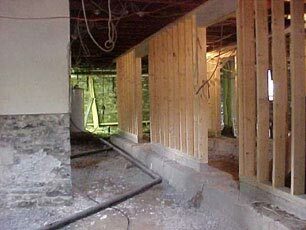 Several main beams were reinforced (parts had been cut in the past). The electrical and heating systems were upgraded. The original windows were kept and restored. The roofs were repaired and resheated. The interior wooden floors were sanded and refinished. The interior was painted. The kitchen was renovated with new counters and appliances. One of the many challenges was the brick masonry restoration. The original residence was a one-storey building. 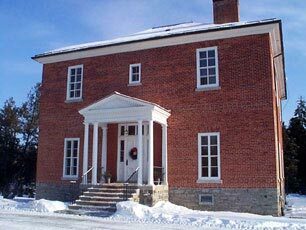 Rideau Cottage brick masonry was repaired over time with bricks of different sizes and colors. Special dies were used to harmonize the color of those repairs and give the envelope a pleasing appearance. The windows were restored. Rideau Cottage after the exterior envelope restoration work that involved using dies to harmonize the color of previous restoration work with the rest of the exterior envelope and new restoration work. The windows were restored. Shortly after its construction, a second storey was added using a different type of brick and a verandah surrounding three walls was built. The brick under the verandah was covered by stucco painted to imitate bricks. Later on, the verandah was removed and a small porch added. The stucco remained on the brick of the first storey. The overall aesthetic effect was not very pleasing. Using a "staining" technology, each brick and joint was dyed individually. The entire building envelope was restored to a pleasing appearance while keeping the original and repair materials intact. 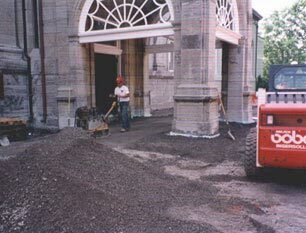 A few steps at the Rideau Hall main entrance prevented persons in wheelchairs to access the main lobby. They had to enter via the service entrance or the service personnel had to install plywood ramps when people in wheelchairs participated to official ceremonies. By slightly modifying the access road slopes and subtly adjusting a few architectural details, the main entrance was made fully accessible. Work under way to modify levels at the main entrance to render it universally accessible.